Metropolitan Design/Build is your first response roof contractor in Maryland, DC, and Virginia that provides emergency house repairs. If you have an emergency and need immediate service, we can help! When you experience damage to your roof, it means that your home and property are vulnerable to the harsh elements. It is very important to act quickly in order to prevent wind, rain, and other debris from further damaging your home. At Metropolitan Design/Build, we have certified roof installers and have over 26 years of experience in repairing and installing roofs. It is important that you contact us as soon as you notice you have a leaking or damaged roof. The sooner Metropolitan Design/Build can be notified the sooner we can start helping. Our expert roofing team is always ready to assist you. We will arrive quickly to inspect all the damage and assess the immediate problems and make whatever short-term repairs to prevent further damage to your property. We will then discuss with you all the issues involved with your particular roof damage and provide an accurate and detailed estimate so permanent repairs can be made. We have experience dealing with all the major insurance companies and will be more than happy to help you with the entire repair process. 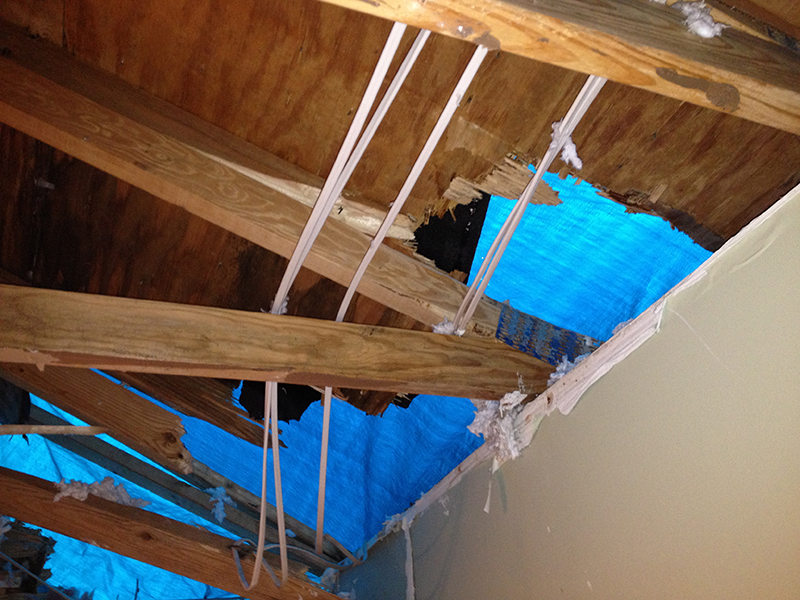 We can provide estimates, pictures, and other documentation all directly related to your storm-related roof damage. If you like, we can even contact your insurance adjuster directly to help clarify any and all questions and concerns they may have regarding your storm-related damage. Storms in the DC, Maryland, and Virginia area can be very powerful and can cause expensive damage to your roof and home, which is why people rely on Metropolitan Design/Build for emergency roof and house repairs. If your roof is leaking that means your home is exposed to the elements and water and wind can cause damage very quickly. When water damage strikes it shows no mercy, water can quickly damage walls, floors, furniture, and other personal effects. Avoid unnecessary damage and further repairs by calling Metropolitan Design/Build at the first sign of water or other storm damage. Our storm damage specialists can help you with all your emergency needs quickly and efficiently. Metropolitan Design/Build is the roofing contractor that the Maryland, Washington, D.C. and Virginia metropolitan area homeowners rely on when it comes to repairing storm-related damage. We are licensed and insured in Maryland, Washington D.C., and Virginia. We have been a top roofing company in the area for over 26 years and we pride ourselves on the fact that our superior customer service, quality craftsmanship, and professionalism have gotten us here. We are proud of the work we do and take great satisfaction in the fact that our customers refer us to others in the time of need and we continue to get repeat business from homeowners in Maryland, D.C., and Virginia communities.